As mentioned in my post last week, Prof. David Wise from the University of Illinois at Chicago visited McGill. In this post, I want to cover some of the science that was discussed during his visit, and I will focus on some of the take-home messages from his research seminar which was about “Spiders, decomposition rates, and global climate change“. This topic has held the interest of ecologists for some time. There has long been an assumption that spiders have the potential to indirectly affect litter decomposition rates through their predation pressure on soil invertebrates that are directly involved with breaking down deciduous leaf litter. Interestingly, some of the early work on this topic was done in Quebec, at McGill’s Gault Nature Reserve (Mont St Hilaire). 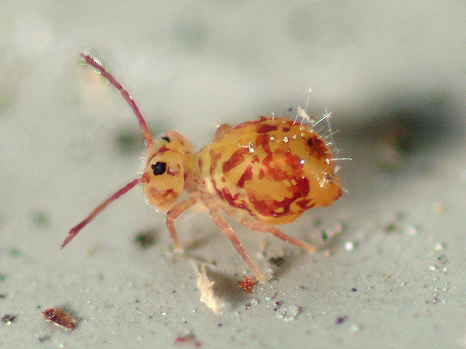 In the late 1960s Clarke and Grant removed spiders from leaf-litter habitats and documented an increase in the assumed “spider food”, including Collembola (springtails). Although the work by Clarke and Grant was unreplicated and had other methodological issues, it did get a lot people into thinking about these interactions (and trophic cascades). This, by the way, is a marvellous photograph of a springtail. You can visit this site to see some more lovely images (thanks, Ashley!). A lovely springtail, (c) A. Bradford, reproduced here with permission. A Figure from Kendra and Lawrence's paper. "FSR" refers to a spider removal treatment. The increase in rate of litter loss for this treatment is quite clear. 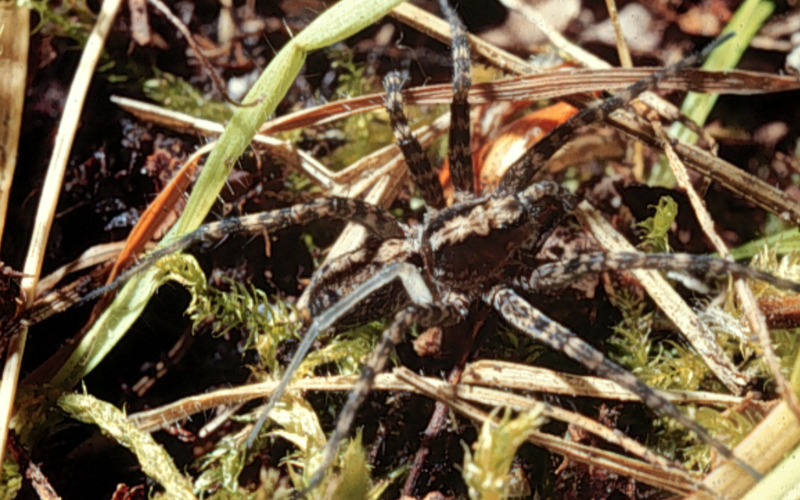 At the end of the season, when juvenile spiders were added to treatments, there were fewer collembolans. You might think that the work could stop there – i.e, the relationships between spiders and collembolans has been established, as has the indirect effect of their predation on litter decomposition. Kendra Lawrence and David Wise did not leave this alone. Instead they completed a longer-term study of the same interactions, and it’s a good thing they did! In their follow-up paper, the experiment was extended over a 17 month period. 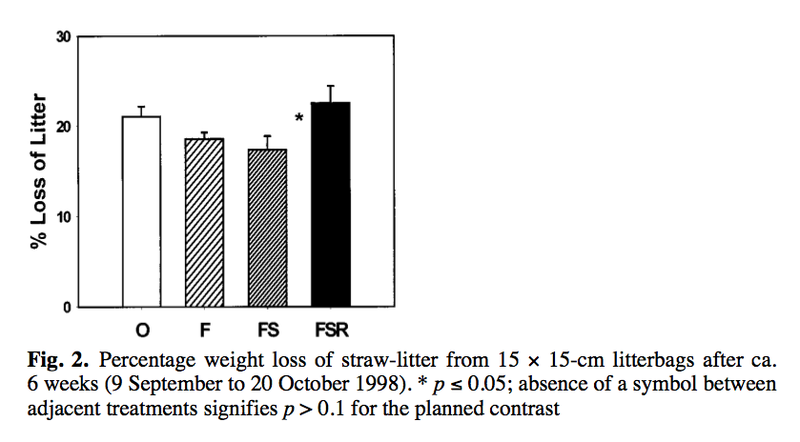 In this work, they reported an opposite effect – leaf-litter disappearance was actually LOWER in spider-removal plots. That is sobering. Ecologists, this is a clear signal – do field experiments over longer periods of time, and expect the unexpected! So how does climate change fit into this? David Wise showed us some of the work that he did with his student Janet Lensing. 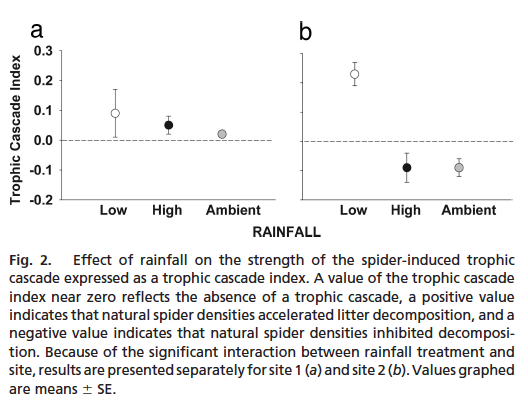 In this research they manipulated ‘rainfall’ in enclosures to which spider number were manipulated, to see if the trophic interactions outlined above were affected by precipitation. This was done because one of the key predictions of climate change includes higher variation in rainfall. Interestingly, they showed (in their paper published in PNAS) that not only was the trophic cascade affected by rainfall (i.e., higher rainfall decreased the strength of the trophic cascade), but also that the effects depended on the ‘sites’ (originally planned as replicates), located very close together. Ecologists: be careful about what you assume are ‘replicates’! David Wise and his students have illustrated that leaf-litter habitats are ideal model systems for studying food-web ecology. They have uncovered some fascinating interactions (many more than I have written about here – you can visit this site to get a list of some more publications) and there are clearly important interactions between spiders, collembolans, litter decomposition, and these interactions are affected by rainfall. To me, it was most fascinating that these effects can vary within a few hundred metres in a single forest and their work illustrating a reversal of the effects of spiders on leaf litter loss is very important. Ecologists working in deciduous leaf-litter systems must study their systems for a long time, and be careful during site selection. You actually make it seem so easy together with your presentation however I in finding this matter to be actually something which I believe I’d never understand. It kind of feels too complicated and very broad for me. I am looking ahead for your next publish, I’ll try to get the hold of it!